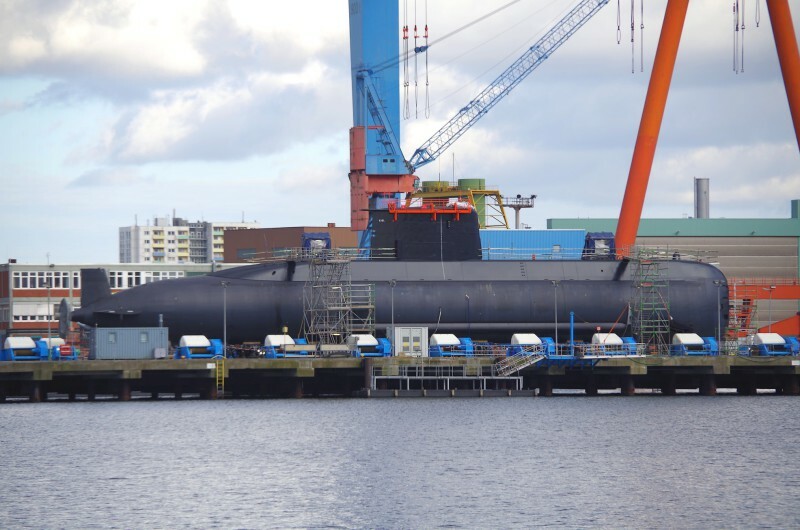 U-Boat Class 209-1400mod at TKMS (HDW...) Kiel. @ gdp... You are probably right about the crush depth. Germany export submarines are normally made of HY-80 steel and the ratio of crush depth to operation depth is usually 1.5! So what you said makes perfectly sense for me. Since the first unit was named S-41 this one would be S-42 if it is in deed the second unit and not just the first one put onto the lift again for checks after the sea trails. I would be very sceptical about a 500 m operating depth that is usually not achieved without resorting to titanium or some advanced steel alloy. I would assume that it is the crush depth giving a max operating depth around 300 m.
Egypt signed a deal to buy two Type 209/1400mod submarines in 2011 and then ordered two more in 2014. The first submarine was launched and began sea trials in December 2015. The second two submarines are currently being constructed. Built according to requirements of the Egyptian navy. 8 x 533 mm torpedo tubes, crew 30. Yes, like Marco said, this is the second Type-209/1400mod submarine currently being built for the Egyptian Navy. I`m sorry but this is not a class 214 submarine. It's a class 209-1400mod submarine. Probably for the Egyptian Navy. This photo has been shown 1,957 times since it was added to the site.